Whether you’re pumping gases or liquids, whether they’re constantly in operation, used periodically, or employed in emergency situations, pumps need to work like you expect them to when you need them to. 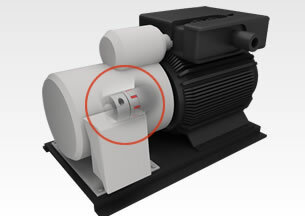 By the nature of their designs and function, pumps usually do not require high precision to ensure proper performance, but reliable, high quality couplings are a must. In the above example, a Miki Pulley model AL spider jaw coupling between the pump’s hub rotors helps mitigate motor vibration. These couplings also compensate for minor shaft misalignments that can lead to equipment damage and costly downtime. Engineered with cost and performance in mind, these spider jaw couplings utilize a simple design that sandwiches a nitrile rubber buffer element (the “spider”) between two sintered aluminum hubs. The sturdy, lightweight aluminum alloy hubs decreases inertia on starts and stops for reduced wear and maintenance, and more consistent performance. 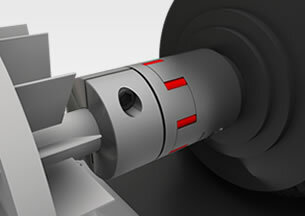 Input and output shafts can be coupled or separated easily by simply moving the coupling in the axial direction. AL couplings are available in standard bore sizes with keys and setscrews or pilot bores; upon request, bores can also be custom-machined to your unique specifications. Request a quote on shaft couplings, shaft brakes, and other motion control solutions for your pumps. Or, contact Miki Pulley for more information.